In early October, 2007, we received an emergency phone call from a neighbor one half mile down the road. She told us two ”little white dogs” had taken up residence in the evergreens next to their house. She had no idea where they came from. 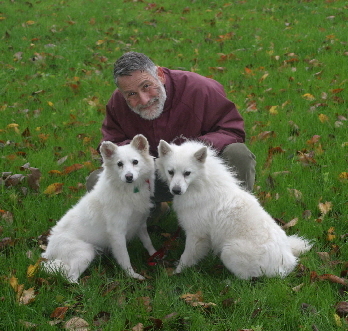 These two “little white dogs” were two American Eskimo dogs, one male and the other female. They had no collar or any identification. We named them Jack and Jill. Jack (on the right) was very outgoing and friendly and Jill was very shy and looked like she was pregnant. Jill, not pregnant, was found to be having a false pregnancy. We immediately took them to our vet while starting an intensive investigation to find their owners. Jack and Jill received a complete exam, a check for microchip, received all vaccinations and were spayed and neutered. They were also treated for whipworms. After several weeks with no owners found, American Eskimo Rescue helped us place Jack and Jill in permanent loving homes. We at Codas’s Haven thank you for your financial support through our soap sales. The cost for treating and saving Jack and Jill was covered, in part, by your soap purchases. Thank You!